Last Thursday, I published a post where I shared my thoughts about Caitlyn Jenner and the fact that she, deservingly, won the an award for courage at the ESPYs, but I never really explained what Thoughtworthy is and the idea behind it. It is going to be a running series on this blog, and whenever I have a thought or a conversation about something that is noteworthy, I will blog about it. These will be up on Thursdays, but not necessarily every week, and I will try my best to keep the posts as short as I can while still getting my point across. I hope that this series can help spark a discussion both in everyone’s life and in the comments below. Author Hannah HaefelePosted on July 31, 2015 Categories CollegeLeave a comment on What is Thoughtworthy? Growing up, I had this idea that I was going to go to a single college or university, and I was never going to transfer. Transferring was for other people, but I would never do it. A few years into college, I have realized that it’s okay to want to change schools, and if the school you chose turns out to be not the right fit, by all means find a better school. Since I have transferred twice, I think that I should let you, the reader, know what I think about transferring universities. First, my educational backstory. I went to a ~very~ small private high school; in my graduating class, there were 8 of us. This meant that I was not used to the large class sizes that come with a typical university. My high school was also an Expeditionary Learning (EL) school, so we did a lot of hands on, community based learning. It was quite far off the main path. As my senior year rolled around, I started taking a couple online classes from my community college to get a head start on my degree. I don’t think I will graduate early, or even on time, but more on that later. Anyway, I decided to go to the community college after I graduated. My seventeen year old self wanted to put off worrying about how to send transcripts. Due to my head start, I finished my associates degree in liberal arts last December, which meant that I had to figure out where to go next. What was I going to do? I spent this past spring semester at a public university close to where I live, and it was a good school, but I had already contemplated transferring to another school. At this smaller university, I could have the experience of living on my own and I could also do what I love: music. I could have done music at my old university, but its program is very competitive, and I was not accepted. Sure, I could reapply next year, but I didn’t really feel a connection with the flute teacher, she was a little snobby. And the big school was also not the best thing for me. You are not happy in your current environment, and you know another school would be a better fit. If you are uncomfortable are stressed at your current university, you should definitely look into different schools. If this is the case, try to avoid schools that are similar to your current one. If you look at similar colleges, you will probably have a similar experience. You should look for schools that have qualities that you think you are missing or you think would be helpful for you. You are at a community college, and you want to earn a bachelor’s degree. Most community colleges in the United States offer two-year associates degrees and some certificates, but I have yet to come across a community college with a bachelor program. Some have partnerships that allow you to complete certain degrees on the same campus, but the last two years are through a different university rather than the community college itself. You have decided to switch majors, and your current school does not have said program. If you are at a school majoring in one thing and want to switch to a program that doesn’t exist at that school, you will probably need to transfer. You want to be with a friend or two from high school. If you switch schools to be with an old friend, you will probably be disappointed. The university where your friend is may not be the one for you. It is better to be in an environment where you are happy than to be with a friend. Technology is very prominent in our society, and it is very easy to keep in contact with friends and family from home. You had one problem class or professor in a general class. If there is one problem you have and it is an isolated issue, you can probably avoid it in the future. If you disliked one class or professor, especially if it was in a general Ed class, you probably won’t have to be in that situation again. If you do have to take another class from that department, check is you can take the other class from a different professor or in a different way (i.e. face-to-face vs online, lecture hall vs small lecture class). You want to finish your degree as soon as possible. Even if you are transferring through an articulated agreement, you might be setting yourself back by transferring. Not all schools will accept all classes from your originating university. 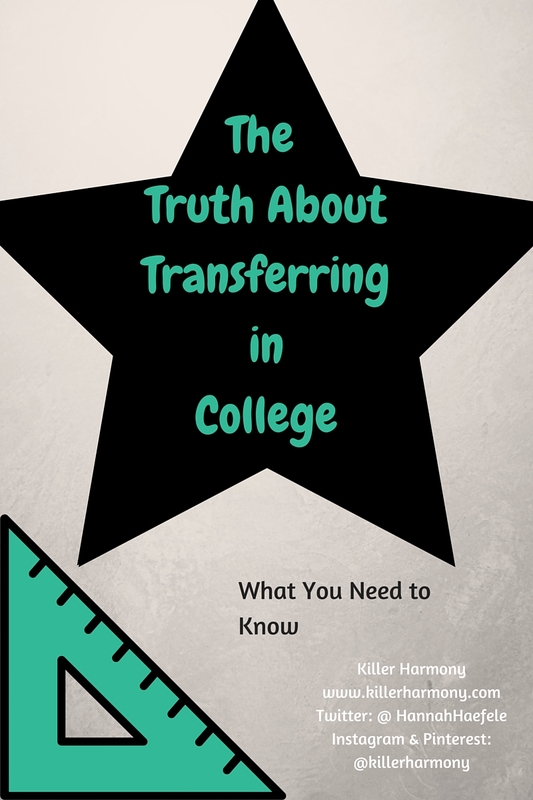 Be sure to check the website of your current college and the school where you want to transfer. If you have been following the news in the United States, you have probably heard about how Caitlyn Jenner was recently given an award from ESPN for her courage in coming out to the world as being a transwoman. You might have also heard of some of the nasty comments that some people have made about the choice to honor Caitlyn rather than someone who “has more courage” or “did something more brave”. I have to say that those comments are extremely ignorant. Coming out to the world after being in the spotlight for multiple decades is not easy. If you have seen the interview of Jenner by Diane Sawyer, you would know about the struggles that she (Jenner) has faced with her identity. She has now finally come to terms with it, and she is being open and sharing her story to give this often unheard community a voice. I understand that it takes a lot of courage to serve in the military or do whatever it is that people believe should have been the basis for that award. However, giving the award to Caitlyn Jenner has not only honored her, but I believe that it will have a huge impact on the lives of people, especially young people, who might be struggling with their identity in anyway. I was recently on a family vacation for about a week. I did not want to leave my instrument for too long, and since a flute is small, I decided to bring it with me. I did not take my good flute, that would not have been a good idea unless I was set to play a nice show where I absolutely needed it. But, bringing the instrument on a flight was not as difficult or annoying as you might think. Yes it is a flute, but I had no problems with it at the airport. I do have some tips and quips if you will be flying soon and you plan on bringing your instrument. 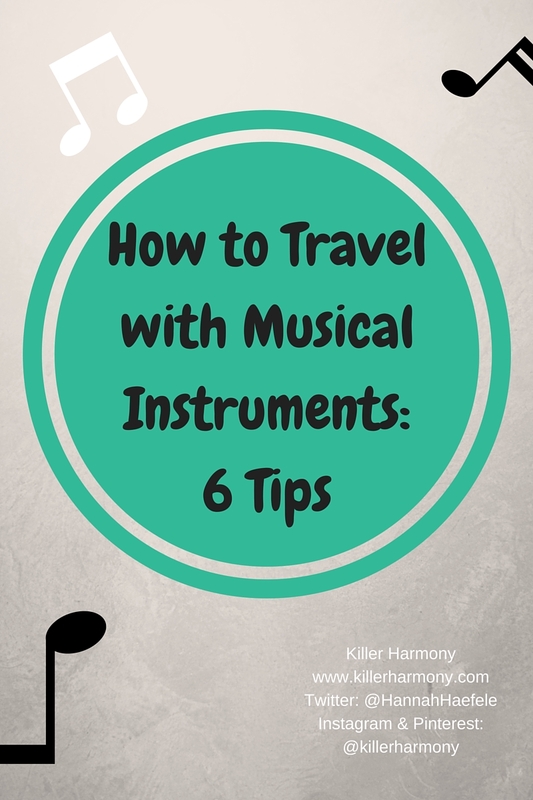 Here are my top tips for travelling with a musical instrument. 1. Pack smaller instruments in a bigger bag. If you play the flute, piccolo, clarinet, or oboe, leave space in your carry on for it. This makes it easier, because you don’t have to sacrifice a personal item to take your instrument on the plane. Just be sure you leave space and pack it last in case security asks you to remove it for scanning purposes. 2. Pack other items in your instrument case. If you have an instrument that fits the carry on size limit, but you would rather not pack it in a carry on, pack other items like clothes in the case. If you roll them up, shirts and underwear could fit in the bell of an a lot saxophone or socks could fit in a trumpet bell. If you play violin, pack clothes around the instrument to help protect it while smartly using space. 3. Be prepared to check larger instruments. If you play a brass instrument (with the exception of trumpet) or a large instrument in general, you might be required to check it, either when arriving at the airport or at the gate. While the TSA is required to allow an instrument in addition to the carry on and personal item, not all airlines will allow the extra baggage. If you are unable to consolidate your items, you might have to check one of the items. 4. Leave a note in the case of a checked instrument. 5. Consider buying another seat for a large instrument. If your instrument does not fit the carry on size limit and you are uncomfortable checking it, it might be worth the extra money to purchase a seat specifically for your instrument. That way, you can keep it with you and you won’t have to worry as much about damage. This is good for string instruments, which could be smashed if other luggage is tossed on top of it, or woodwinds, which have a ton of moving parts that could be thrown out of alignment during a security check by someone who doesn’t understand the fragility of a musical instrument. 6. Get to the airport earlier than necessary and buy up to board early. This will give you extra time to speak with airport staff about taking your instrument on your trip and how to avoid technical issues. The earlier you can board the plane, the more space there will be in the overhead bins. If they are full before you get on, you risk having to gate check one of your items. TSA PreCheck is your friend. This is less a tip and more of a random way you can have an easier time traveling. If you are lucky enough to get the PreCheck, which allows you to leave your shoes, belt, and jacket on and your liquids and laptop in your bag, it will make going through security a breeze. When I had PreCheck, I did not feel the need to remove my flute from my carry on suitcase. Only check your instrument as a last resort. Sometimes, we can’t avoid a checked bag, but use the tips given to lessen the chance of having to check your instrument. Especially if you will be changing planes, you don’t want to end up at your destination only to find that your instrument is in another time zone. Mistakes and mishandling are rare, but they do happen, and you don’t want to be the one they happen to. I hope you find these tips helpful, and remember to be safe when traveling. Have you ever traveled with a musical instrument and what was your experience like? Let me know in the comments! Oh, language learning. One of my favorite things, and one of the things I started in school. But is the classroom really the best place to learn a second language? This past May, I finished a semester where I had two foreign language classes: Spanish and French. I was originally planning to major in Spanish, and the program I was in required a second foreign language. I have since then changed both majors and schools, and I intend to continue learning languages on my own. So, I thought now would be a good time to explore the pros and cons of foreign language classes. A class is scheduled. You have a specific day and time set aside to go to class and work on your target language. It is easier to find study buddies. When you are in a foreign language class, the other students are usually at the same level as you, which can be good when it comes to needing a practice partner. You both know what you have to learn, and you can help each mph other, since you understand how much the other person understands. The instructor can be a good resource. As with any class, a good foreign language teacher can be very helpful to their students. You can go to them with questions about the material, and they should be able to help. A classroom is very structured. This is probably a pro for some people, but I don’t like to have to learn specific material that I know I will hardly ever use. I think that structure is important for complete beginners. We should all know how to greet people and talk about ourselves, but there comes a point the vocabulary is not necessarily going to be the best for each person. There are a lot of grammar drills. In a classroom setting, the teacher has to be able to teach anywhere from 5-50 students, and some schools and colleges have a specific curriculum that has to be followed. These lesson plans include a lot of busywork practicing grammar without really putting things into context with everyday life. This is fine for awhile, but it soon gets boring. You are not as independent as you could be. You are stuck learning the same thing as everyone else, and if you are either way ahead or behind the rest of the class, you will not have a good experience. If you are learning faster than average, you will get bored. If you don’t learn as quickly, you might become resentful of the language as catching up will seem like a chore. I think that when you are just starting to learn a new language, it is good to have some guidance. This semester, my Spanish class was intermediate, but I was in French I. The knowledge of a teacher was very helpful in beginning the language, and I believe that is especially true for someone who has never gone about learning a foreign language before. Once you have learned one, it is easier to teach yourself another, because you will then know the best method for you. Visit itsmixedarts.blogspot.com for my lifestyle and music blog!